Home > Telephone & Mail Scams > Price Fixing Scams: What's Being Done to Protect Consumers? It could at last be time for the big consumer fight back, as it seems that the Office of fair Trading (OFT) are cracking down on bogus price claims and fake bargains on sale in the high street or online. These are where shoppers are encouraged into a store or onto a website by the promise of massive reductions on high profile, well known products which have magically ‘sold out’ by the time you want to buy them. These are tactics which are used mostly by airlines when trying to sell ‘cheap’ flights. They advertise a low price but this soon increases when you take into account the additional extras that aren’t actually as optional as you think they are. The OFT has said that in the future it will be illegal to splash posters all over shop fronts advertising reductions of ‘Up to 75 per cent’ unless they are genuine. It will also be against the law to advertise big savings against a recommended retail price that was never actually charged for an item. The shops and retailers are now being warned that unless they stop trying to convince consumers that they are getting a better deal than they actually are, they will be on the end of what they describe as ‘highly embarrassing prosecutions’ which will name and shame the worst culprits. The OFT decided to take action after it carried out a study involving consumer research, human behaviour experiments, and the psychology of sales tactics. The research revealed some of the sneaky tactics used by retailers and highlighted the ways in which it impacted on the way people spent their money. At a time when many households are finding money tighter than before, the offers of huge discounts and unmissable bargains can be hard to resist. 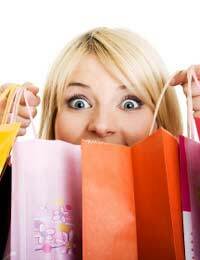 As a result, many consumers lose money, buy things that they might not otherwise have done, and can feel deceived. The official customer body, Consumer Focus, is in favour of tightening up the rules to squeeze out misleading practices. A spokesman said that it was only right that consumers should know exactly what the goods and services they wanted to buy would cost them, and condemned ‘drip pricing’ for the way it advertised low prices so that companies could come in at the top of price comparison sites, but then turn out to be not such great bargains after all. He added that consumers were frustrated by seeing prices bumped up by ‘optional extras’ like booking fees and handling charges that were automatically applied at the end of the sale. However, the British Retail Consortium disagrees with the publicity though, saying that the OFT were treating consumers as if they were stupid, and that in fact they were experienced in making judgements about prices and value within stores, between stores and over periods of time. A spokesman for the organisation said that promotions and discounts were all a part of the competitive retail market and that they benefited consumers who were looking for value and bargains.